It takes a lot to shock the monkey. 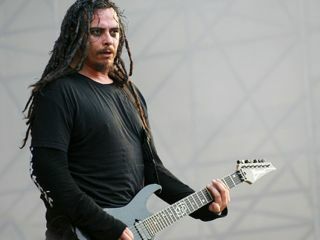 But Korn guitarist James "Munky" Shaffer was taken aback when he learned that his side project, Fear And The Nervous System, had fans concerned he was going solo. "I am not leaving Korn," says Munky. "I started this project because I want to express myself musically and show the world a different side of me, creatively. I want to thank all the fans that are willing to take a listen and choose for themselves. "Right now I have 13 tracks done and I am currently working on the vocals," he continues. "It is a challenge for me but I love it and my heart is in to it. I don't want to rush this project and I want it to be the best it can be so please be patient and I won't let you down." Munky adds that ex-Limp Bizkit and current Black Light Burns guitarist Wes Borland won't be on the album, as was previously planned. "I love and respect Wes and we have worked together but his priority is with Black Light Burns. The tracks that he played on did not make the cut for the record. However, he is still involved in this project - he painted the amazing cover art and I can't wait for everyone to see it." Fear And The Nervous System's debut album will released via Munky's own label, Emotional Syphon Recordings. It is described as "an exciting project that opens up the boundaries of rock, harkening back to the days when music was fearless."